While we’d run over to any bar with a good enough LIIT in a jiffy, themed bars pack in a full-on experience with their decor, food, and signature drinks. Here are 7 of the most amazing ones in town. With a typical retro bar vibe and framed photos of Bolly celebrities on the walls, the Bombay theme here is spot on. They’ve even got food—like Juhu Beach’s Tawa Pulao and Chowpati Ka Chakhna—named in sync with the theme. Yes, you can expect Bollywood music here, too. With three different areas under one roof, inspired by different time periods—Renaissance, Pre-Industrialisation and Victorian—ERA Bar & Lounge has three different themes for different moods. Be it a vodka soda in peace or LIITs on the dance floor, this CP joint has everything to offer. A recent addition to Cyber Hub, The Drunken Botanist has a green theme with vines and plants all over the walls and ceiling—it’s like drinking inside a greenhouse. You’ll also get cocktails like the Botanist Martini and Botanist LIIT in keeping with the theme. This space themed restro-bar in Gurgaon has two floors—Gravity and Anti-Gravity, each with its own set of quirky decor. Think levitating objects, celestial bodies, geometric patterns all around and all sorts of other paraphernalia to make you feel like you’re out on a spacewalk. Don’t forget to grab a smoke-filled drink at their Infinity Bar! Having undergone a total revamp, Ek Bar has got a new ‘Make in India’ theme which focuses on celebrating regional influences that stand out in its decor, food, and drinks. Cocktails like Commissioner Sahab, Angreji Whiskey Soda and dishes like Punjabi Bagh Wala Gentrified Chicken and Make In India Popcorn Shrimp really amp up that desi vibe. With two outlets—in GK and SDA—What A Comic Show is the place to get your superhero fix. 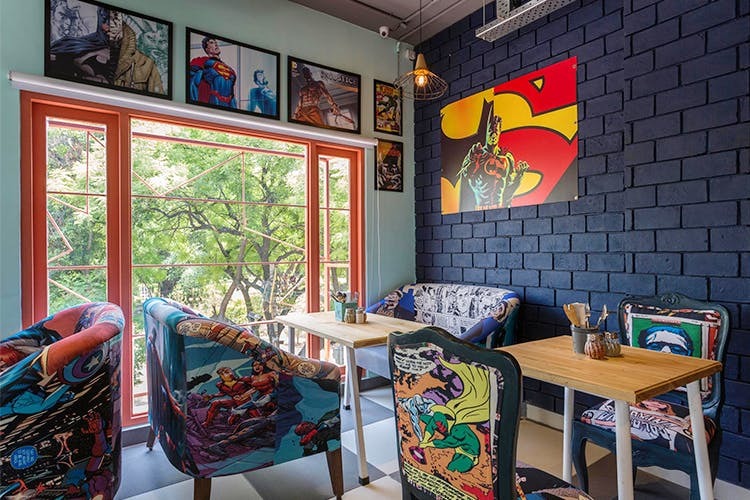 The walls are lined with comics, posters and collages, and the decor is just a burst of colour. We love the SDA one for its cosy balcony and drinks like Iron Man’s Electromagnet, Batman Punch, Poison Ivy and more.